We are reputed Manufacturer and Supplier of Textile Speciality Finishes in Chennai. Our Indian Speciality Finishes delivers high performance and is safe for the environment as well as for human beings. We provide Speciality Finishes that is quality-checked before final dispatch to the customers. Clients can get Speciality Finishes from us at market leading rates. Spiropel 555 Non ionic Fluorocarbon Emulsion with good compatability with cross-linking agents, catalysts, softners and other auxiliaries. Gives Durable Water & Oil repellent Effect. It can be used on all type of Fibres. Spiropel 655 Cross linking agent based on blocked isocynate compounds A bifunctional cross linking agent. Imparts durability and handle of the textiles. Spirofinish UV 100 UV Absorber Gives Exellent UV Absorber Characteristics. Enhances color Fastness to Light and perspiration of cloth. Spiroflame 550 Flame Retardant Gives Flame retardant Finish on Cotton. Spirofinish APL 200 Antiphenolic Agent Prevents the yellowing property of white and light due to phenolic compounds of packing material. SpiroFinish MRC Mosquito Repellent Agent for Cotton It protects the human beings from the bite of mosquitoes and thereby promising safety from the diseases like malaria and Nile fever. Lower Localized abrasion & streak marks. Spirojean AZ Anti ozonate Organic Softener Protect Indigo Dyestuff Against Ozone. Prevents Yellowing Caused By Sunlight. 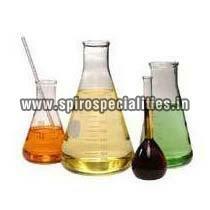 Spirothread L 1000 Formulations of polysiloxane & Polymeric additives Reduces coefficient of friction. Reduces the hairness of the thread. Uniform pick up across thread surface. Dries fasty at room temperatute. Spirosin 228 Low Formaldehyde cross linking agent for cellulosic fibre and their blends Applied for Wrinkle resistant Finish. Spirosoft PE Conc Non ionic Poly ethylene Emulsion Improves Tear and abrasion resistance.